Thanks Mike, what an excellent report! We are working on your recommendations and will do a more thorough job of keeping everything up to date. When we are busy with day to day tasks, it’s easy to forget about keeping up on the network. It’s that old ‘if it’s running, then it’s okay!’ thinking. Mike always took the time to explain (in non-technical terms) what we needed to improve and why we needed to change things. This helped define our challenges and fine tune our solutions—with incredible results. I had a good understanding of what Mike was coming in to do for us, and so did he. We were on the same page from day one. Even now I am still in discussion with him and learning from him. Thanks Mike! Better than other providers, you were quite attentive to details and responded quickly. Your services were well above my expectations. I didn’t expect such an in-depth analysis, and was pleasantly surprised by its detail. Mike, you provided an outstanding and very helpful audit. Many of our issues were simple once we recognized them; and the resolutions were simplicity in themselves. But as usual, even the most obvious problems aren’t always tangible without an ‘expert eye’ like yours to analyze them. Thanks again. What really impressed me was your professionalism. Your advice and suggestions were to-the point and they helped us get on the right track. Everything you offered us exceeded my expectations, and the final report was good. Thanks for your help! thoroughly enjoyed your review and learned a lot. Your program was full of excellent, practical information that was presented clearly and concisely. We have already implemented recommendations provided at our IT Security audit last year. Wow! I was amazed by the amount of custom information included in the program. Its timing was perfect, and Mike’s knowledge was excellent. I definitely increased my understanding of the Internet and the growing number of security issues IT must continue to tackle. Mike was able to diplomatically identify and address our exposures. Mike’s approach, detailed review, and sense of understanding was invaluable. I look forward to next year’s visit! Mike is very knowledgeable in this field, and his specific examples and resources are great. Our business culture and risk assessment both affect our decisions on IT security. Working with Mike was much more productive than past experiences with consultants because his focus wasn’t overly technical, which allowed the decision- makers to better grasp our needs. I wish we could work with Mike more, at least once a year in order to keep us on track. He provided a fresh outlook from a different perspective, and the outcome of his visit was excellent. While his technical knowledge is amazing, I was most impressed with Mike’s people skills. I very much look forward to our next meeting. Whether management wants to admit it or not, IT security should be a growing concern for every company that does business on the Internet today. We’re lucky to have people like Mike around to help protect our interests. His content was excellent, contemporary and easy to understand. Mike is knowledgeable, easy to understand, and his advice is directly applicable. The action steps he offered during his presentation were not only practical, but easy to implement. As a speaker, he is empathic without being overbearing. It was a pleasure listening to Mike speak. Some professional speakers can seem cold or aloof, but I was delighted to find Mike approachable, interesting, and easy to listen to. I found his information to be on the money and truly viable. After hearing Mike speak and benefiting from his insight, I know what I need to do (starting with an audit of our IT professionals soon!). I think Mike offers a great seminar, considering that this can seem a pretty dry topic for non-tech people. I think the most relevant part for me was learning to ask the right questions, and how to get critical IT info without going internal. Although Mike offered a lot of information to absorb, he made it accessible and easily to digest. Now I understand the importance of having a real IT strategy. Mike is extremely knowledgeable on many security-related topics, which makes his speaking engagements informative and enjoyable. Just hearing his program really increased my own awareness of what’s going on today in our industry. Attending Mike’s presentation greatly increased my awareness of the security situation in my business. Even non-IT types can understand Mike’s message, and after attending the seminar, I feel I can at last have an educated conversation with my IT guy. The ‘check list’ portion of the program was very good—I’m already using it! I thought Mike’s seminar was packed with good, useable information, and that it was presented in a way that kept everyone’s attention. Even if all I came away with was the advice ‘encrypt more data!’ this program was well worth it. Mike’s examples are very relevant, and his style of speaking encourages people to participate and ask questions. I’m going to take action on several of his suggestions. The big thing I came away with was a heightened awareness of the current security situation. Mike’s was right on target. He kept the subject approachable with relevant examples, by encouraging audience participation, and with his own expert insight. Even with a one-person IT department, I believe we can achieve success, thanks in part to what I learned by attending Mike’s seminar. You are great! I knew right away that you were definitely someone who knew their stuff and could help protect us. Your program was easy to follow and moved at the right speed so everyone could keep up. I certainly benefited from your knowledge, and plan to put your recommended action steps in effect as soon as possible. Thanks! Mike offers an engaging presentation that clearly demonstrates his mastery of the topic. He educates his audience without using a lot of technical jargon, and increases their awareness of current security risks and what they can do about them. I think attending Mike’s presentation could help a lot of executives better understand the point of diminishing return. I think the most significant thing for me was how Mike got me to realize just how important the subject of security is today. By keeping his presentation direct and understandable to laymen, Mike taught us a lot about the security risks we face. In addition to all of the great tech advice and business solutions he offered, I also came away with a new-found respect for the role of the IT person! After attending one of Mike’s seminars I realized that I came away from it able to ‘see the big picture’ a lot better. I learned a lot in a relatively short time, and I will put Mike’s suggestions into place right away. I enjoyed listening to Mike speak, and hearing him answer questions from other participants. I felt I was listening to a friend talking shop at a Starbucks instead of attending an educational seminar. Thanks for a great experience. What an eye-opening presentation! It really woke me up and showed me how much more we need to learn. I think the most valuable part of Mike’s program was the ‘Action Plan to Security.’ I learned a lot and plan to put Mike’s suggestions to work right away. This was an excellent seminar packed with great ‘take aways’ that will help me and the company I work for. I found Mike’s presentation to be intelligent and pertinent, and his audience interaction helped maintain the momentum. I think his ’12 Steps’ was the best part of the program. Thank you for an enjoyable and educational presentation. I found your program very interesting, but for me, the real core value was the action plan samples you offered, and your tips for effective communication with IT professionals. These two points alone would have made the seminar worthwhile! Thanks for the sound advice and your excellent insight. Both the content and the way Mike presented it kept my attention and made it easier to learn more about the subject matter. Mike was very knowledgeable and the time passed quickly. After it ended I felt I had a solid plan to help me head off any potential security disaster, and that kind of peace of mind is priceless! Mike delivered an excellent program that showed us how vulnerable we really were, and how dangerous it can be to be in this business without strong IT support. He held my attention throughout the program with his practical examples and lively audience interaction. I learned a lot and will put it to good use immediately. Security is a big topic, but Mike was able to cut it down to size so everyone could all understand it better. Not only did I learn a lot, but Mike kept it interesting the entire time. Of all the important information I got from attending, I think the most urgent part for me to follow up on was having an IT audit, and soon. Mike gave me a lot of good, useable information in an area that is not my strength. Going in I didn’t know a lot about security issues, but afterwards I felt like I came away with a solid understanding of IT. I know now that I need to schedule an in-depth IT audit just as Mike suggested in his program, especially as we currently outsource our IT work. Thanks for a great presentation. Mike does a good job of explaining complex, high-tech terminology so the rest of the world can understand it. I learned a lot, and especially the parts of his seminar where Mike told us about ‘The Tools’ and the ‘12 Steps.’ I plan to put these to good use right away. Hearing Mike discuss today’s biggest security issues was very educational. Right from the start I found Mike to be very professional and extremely knowledgeable on the subject of IT security. The moment his program ended I scheduled an intensive IT audit, just as he suggested during the program. The time went by quickly and Mike did an excellent job of keeping everyone’s attention. I liked Mike’s presentation because it wasn’t too technical and he kept things moving. By the end of his seminar I realized that we’re not as secure as we thought we were. Mike got me to examine an area of the business that I ordinarily would not have looked at, so thank you! I’m also going to have other members of the management team attend Mike’s speaking presentations. I found Mike’s entire presentation on IT security very helpful! I think the single most important piece of advice Mike offered us was his urgent plea for us to conduct audits of our IT departments to determine its strengths, weaknesses, and potential gaps. His experience and practical advice are a true value. Mike is very knowledgeable in this field. After hearing him speak I’m convinced he is the expert I want helping me protect my information. I found this program to be interesting and educational, especially his technical advice and recommendations for businesses. With my IT guy in tow, I attended Mike’s security seminar and ended up having a great time learning more than I ever thought possible. The program was interesting and full of practical information that I could understand and use, thanks mostly to Mike’s clear explanations. His interaction with the crowd kept things lively, and his reality-based examples made high-tech scenarios easy for non-IT professionals to understand. Thank you for making parts of your presentation funny… it made it easier to absorb the information and kept it interesting… I especially liked the IT IQ portion. Your list of recommended websites was very handy, too. I thoroughly enjoyed your presentation. Thank you! I liked Mike’s examples and concise explanations. His thoughts on home back-up and security were especially useful. It really got me thinking about the importance of IT to the entire organization. Mike gave me a lot of good questions to ask and follow-up on with the IT staff at work. From the start of his seminar I knew Mike was very knowledgeable on the subject of security. The real eye-opener for me was his discussion of firewalls for lap-top work stations. Wow! I learned a lot of new stuff and will put it to good use immediately. You taught me more than I thought I could ever get from a seminar. I think your advice on home and business security was great. After this program I really understand just how at risk we are these days. Mike is a very considerate speaker and a good listener. He took time to hear questions from the audience and then gave them thoughtful answers. My basic understanding of security risks was already pretty high, but after listening to Mike, I realized I needed to continue getting fresh updates to stay ahead. I’d like to know who Mike’s mentors were—they must be pretty amazing if Mike was the student! I came away with a better understanding of the magnitude of the security issue. Because of the size of our company, this topic is even more critical. I’m glad I was able to attend; I learned a lot of valuable information that I can use. There’s no doubt in my mind that Mike knows his subject matter inside and out; I quickly realized that additional security is needed at the office. Your presentation delivered what you promised, and I feel better prepared to tackle our security issues now. In a short period of time Mike covered a lot of information. He made the entire experience enjoyable and worthwhile, and I‘ve already implemented several of his suggestions. Mike took a large and varied topic and made it instantly more accessible. His personality and audience interaction kept the program interesting. His suggestion for regular IT audits made sense, and we’ll conduct one immediately. He is a natural communicator and the tools he gave us make my job easier. Mike’s ’12 Steps to Security’ was the highlight of the program. I left with a much more refined understanding of the risks out there, and thanks to Mike, I’ve got a few good ideas on how to minimize them. Anyone can learn a lot from Mike. With Mike’s help we realized just how easy it is for personal and business data to be transferred if proper security measures are not in place. His examples are practical and easy to apply. My knowledge of current and emerging security risks expanded thanks to Mike’s presentation. Thank you. Your program is fantastic! I found the content to be very beneficial, and couldn’t believe how quickly the time flew by! Of all the important things you discussed, I think the most important aspect of the entire program was your sense of urgency that we all wake up and start taking security issues seriously. Mike is one of those people who can make information relevant even to non-IT professionals. Boosting everyone’s security awareness is an important first step, and Mike’s experience and personality make it seem a lot less overwhelming. I took his recommendation that every business conduct its own IT audit as soon as possible to heart. I really appreciate the fact that throughout his entire seminar, Mike spoke in terms his audience could understand. His section on full disk encryption for laptops was brilliant. I know if we’d had more time I would have learned a lot more, but the knowledge that I came away with was still more than enough to start making real progress. Mike’s seminar on security was eye opening! He’s obviously a great speaker, but what really impressed me was his tremendous knowledge that seemed to be completely current! Just sitting and listening to him share his knowledge about security procedures and potential threats really got me thinking. I really appreciate the tools Mike shared with us; they’ve already helped make our work less stressed. I found all of the information Mike presented to be very relevant and very timely. I know I learned a lot of important information in a short period of time, and I will follow his advice as much as possible. The first thing I’m going to try to implement is an annual IT audit, just as Mike suggested. This is a good program; everyone in IT should attend. I especially liked the graphics, which helped keep the ideas and methodologies clear. Learning about the many complexities of security issues, and how personnel with different IT specialties can help manage systems better was enlightening. I know you could have covered a lot more if we’d had more time, but the material Mike did cover was very useful. What a great educational program! Mike’s seminar is what the IT course in my EMBA program should have been! All of it was easy to follow and important, but I think the best part for me were the tips for PC security when working at home. I’ve already thought of new ways to implement his suggestions. What a great investment. Mike’s presentation was very informative, and he covered a lot of ground quickly without losing his audience. By encouraging audience participation he kept the topic relevant and approachable. The most important part for me was remembering that even the smallest details count—like keeping a hard-drive backup for the company! I learned a lot from Mike because the content was good and he kept his topics engaging the entire time. I loved his ’12 Steps of Security’ and appreciated the sources he gave us too. The pace was just right, and I plan to put a lot of what I learned to work right away. Security is king! This was an incredible presentation, and I learned much more than I thought I would. Mike made it all understandable, and that made it easier for everyone to get on board and soak up as much as they could. I plan to follow Mike’s recommendations using the techniques he gave us during the program. Because security and all of its associated threats and risks is such a large, constantly changing topic, I think a lot of businesses hide their heads in the sand and hope the risk goes away. What they really need to do is attend one of Mike’s seminars. The topic is well covered with solid info. Mike is definitely well prepared to speak on the subject! I came away with a better understanding and new tools and resources to help me minimize the threat. Mike’s mastery of technology throughout his presentation was very helpful, and made it easy to understand. I totally enjoyed myself. I learned so much, so quickly… especially the part about implementing an annual IT audit. Great information in a very comfortable format. I enjoyed Mike’s professional delivery and his message. This program really increased my awareness of just how big and important this is at all companies. It’s up to us to prevent IT disasters. I found Mike’s security program to be both entertaining and informative. He knows the topic thoroughly, and I particularly liked his referrals of websites that I know I can trust. I increased my security awareness and my understanding of what’s going on in the industry right now. Mike is energetic, observant, and fast on his feet, which kept the seminar moving at a fast pace. I gained a lot more insight on the subject, and we’re already adding even more security checks. This was well worth attending. Mike is a terrific speaker. Even though he had a lot of technical information to cover in a limited amount of time, he communicated it like a pro, keeping the IT-related content understandable and balanced for his audience. Having already dealt with spamming, Trojans, and other viruses, I knew security was important, but after hearing what Mike had to say, I now know that staying up to date is more important than ever. It’s time for another IT audit. You scared me! We have a one-person IT department, and after Mike’s program, I realize what an important role IT plays in our success. Mike did a great job explaining the biggest security risks out there, and offered us real solutions. This seminar really worked for me. Mike’s ability to mix humor, knowledge, and real-world examples together created an incredible program for IT techs and laymen alike. I learned just how much the Internet has opened us up to all-new problems—at least now I have some solutions. Thanks! Mike was totally focused on the topic, and his entire presentation was clear and to the point. I learned a lot from this program, but most importantly, I no longer feel like I’m in the dark when it comes to network security. I guess some cynics might say you are creating a crisis to sell your services, but I believe that what you told us is true, and I know that this problem really does exist. Unfortunately too many businesses prefer not to know about it. I appreciate your proactive approach to fixing real IT issues. IT security is a huge topic, but Mike kept it all understandable with his real-world examples backed up with his excellent Power Point presentation. I also liked his use of humor to liven things up. His information was timely and relevant. Now I feel much more comfortable asking important questions of my IT staff. I even know which security precautions to follow for my computer at home. Mike’s positive attitude and interactive style really helped make everything much easier to follow. He offered a lot of specific to do’s for when I got back to the office; I understand the need for developing a more comprehensive IT strategy. 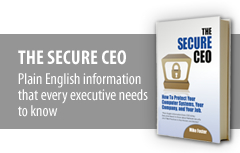 CEOs must bring their IT staff to one of Mike’s presentations! It sounds like a lot of companies need to start implementing real IT security protocols… right now. Overall, I think the program was fast paced and packed with useful information. This is very timely information everyone needs to know as their companies grow and become more reliant on IT. I feel like I really enhanced my personal knowledge of IT security. I plan to implement the ‘12 Steps of Security’ we learned from Mike right away. I learned more about IT strategies and security from Mike’s presentation than I did from by MBA! His security seminar was great and he covered the topic and its many key details thoroughly. An outstanding program and time well spent. I have been in TEL/Vistage for 15 years and mike is the best resource I have ever seen. Everyone in IT security could learn a lot from him. I really liked the part about coaching employees who travel on behalf of their companies, and ways to limit off-site security risks; that part alone would have made attending Mike’s seminar well worth it. I plan to put what I learned into action right away. state of security of our business and personal computers. First, let me thank you for an excellent program. confirmed by VCE Group 3197. Mike’s program was very good; I learned a lot because he makes it so easy to understand. I guess I learned how clueless I have chosen to be when it comes to IT security. I think you have developed your left brain very well! I enjoyed your presentation and could have listened to you all day. I will take action on many of the issues you discussed. I came away from your program with a better idea of how important it is to protect my data and myself. Your presentation moved forward at a good pace and your sense of humor really made the program engaging. While the entire day was excellent, I think the most important part for me was the discussion of home computing and its risks. I always enjoy hearing Mike; his examples are relevant and my level of knowledge definitely increased. Mike wakes me up to the gaps in our security! Your presentation was fantastic, Mike! I really liked the information you gave us on website optimization. There’s so much about security that is changing so quickly out there… we need you back soon! I found your program to be enjoyable and informative. Your discussions on laptop security and website optimization were my favorite part of the program. After completing your presentation I definitely want to set up an annual IT audit. Mike’s program is very professional, and he keeps what could be an overwhelming topic interesting and fun. He seemed to know everyone’s name, and kept us on track throughout his presentation. My IT guy and I know that we have our work cut out for us. Mike is a great speaker and his material is always very topical. I especially liked the sections on backup strategies and domain policies… I’ll definitely follow this up with my team. The pace of his presentation is just right. Mike has a nice presentation style, a blend of humor, instruction with precise use of ‘real life’ website examples. I learned how much I don’t know! I will definitely take immediate steps to implement many of his suggestions. I like the reinforcement to me as a CEO to reduce ‘play time’ by my employees. Mike is very knowledgeable and friendly, and this is the first time that my personal action summary page has been 100% full! I found your program to be very helpful… you reminded me how important it is to educate execs about IT security risks; generally they are blissfully ignorant. I think you really made a lot of people question whether their businesses are secure enough. Mike, your comprehensive overview of IT security and SEO issues, along with your real-world examples, was excellent! I left with a better understanding of how important it is to teach my salespeople about IT security precautions, and how we can all help each other. I really liked Mike’s enthusiasm for his subject; it helped make IT business and security concerns more understandable. I came away knowing that I need to get more involved with SEO. I like the progression of last year’s program part 1, and this year’s part 2, with its refresher on part 1. I’m already looking forward to part 3 next year. Mike offers great insight, especially on how fast technology is moving. Your program was much more than I expected; I wish we’d had even more time to cover more topics. I came away with a better understanding of both the Web and the need for cutting-edge security systems. I am now more confident in pursuing my IT outsourcing options. You did a terrific job covering so many useful topics in such a short time. I found all of your information very informative. I now understand better how critical it is to assess our SEO plan. I learned so much… thank you. I thought you offered a terrific program, with useful information that was well presented and fun. The entire day was full of great content. Now I know that I must become even more involved in IT security… I plan to put your recommendations into place right away. It’s a pleasure to listen to Mike because he is so articulate on the subject of IT security; he is obviously well-versed in the field and totally prepared for any questions we had. After attending the program I know that we have the information we need to ask the right questions when looking at potential new IT companies. I found your program to be very informative and I learned a lot about IT security threats. I also realized the need for an IT home expert on our team, as many of us want to be able to work from home but are concerned about the security of our business accounting software. Thanks for opening our eyes even more! Your presentation was ideal for anyone serious about operational and procedural IT security. I found your examples very helpful, and your overall program logical and quite informative. I especially liked the portion devoted to additional security considerations, devices, and software. One of the things I really like about Mike’s program is that it wasn’t too much or too techie; the content was just right for the mixed audience. The information he shared with us on Search Engine Optimization was detailed and timely. Keep using those scary examples of security nightmares—they work! I really appreciated your clear speaking style, and the way your communicated the importance of the IT security steps we need to take. I think the single most important point I learned was to ask whether a business has an IT security policy. Mike showed us how even ‘road warriors’ can protect themselves online. Mike is one of the best speakers I have ever seen—his presentation is excellent and his content is right on target. I think his website tips are great, and I left with a much better idea of how to improve security at our company. Your exceptional personality really welcomes group input, and makes your program entertaining and informative. Just realizing that we’re not alone in this, and that other businesses have the same IT security issues, was comforting. The pace of the program was just right, and I left feeling eager to start putting what I’d learned to good use. Schedule an IT Vital Systems Review and become one of Mike Foster’s satisfied clients.